Welcome! The lobby of the Deranged L.A. Crimes theater is open! Grab a bucket of popcorn, some Milk Duds and a Coke and find a seat. 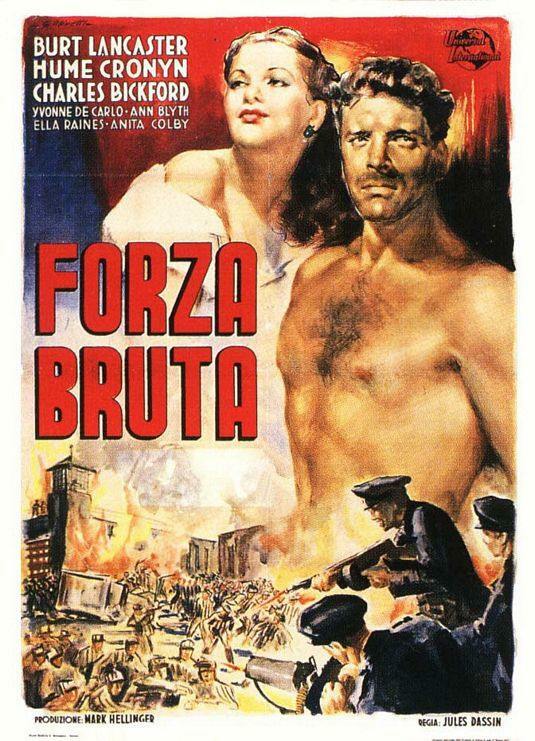 Today’s feature is BRUTE FORCE starring Burt Lancaster, Hume Cronyn, Charles Bickford, Yvonne De Carlo, Ella Raines, Ann Blyth, Anita Colby and introducing Howard Duff. Captain Munsey, the prison captain of the Westgate Penitentiary, is despised by inmates and prison officials alike for his brutal treatment of the inmates. While Munsey’s enemies include prison doctor Walters and Warden Barnes, he is supported by some inmate stool pigeons. One of the stool pigeons, Wilson, is killed when a group of prisoners force him into the workshop steel press. As living conditions at the prison continue to deteriorate, some of the inmates, including leader Joe Collins, who landed in prison for stealing money to support his wheelchair-bound wife, Spencer, Tom Lister and Soldier, plan a breakout.